Ever since the Internet was created, we have been trying to find ways to move away from the traditional storage methods. After all, why would you want to waste the storage on your PC? Especially when my chromebook storage got expand to 500GB from a mere 32GB storage on board. Instead, you can now store your data on remote servers for very little money. The wonderful world of cloud storage has been with us for a while now. And, for the most part, people are enjoying the services. Sync.com, a cloud storage platform that has been around since 2011, operating from Toronto, Canada. Eh, Canada is not just about Bacon, Maple and Syrup. Cloud storage might just be the latest give’er thing that happens to any Canadians. Sync.com is providing cloud storage services for people around the world. In fact, it is one of the best platforms you can find and one of the favorite alternatives to Dropbox. But, does the service stand up to the hype? I had tried it, and I had to say, I am pretty happy with the performance. If you want to know more, you can read my Sync.com review below. 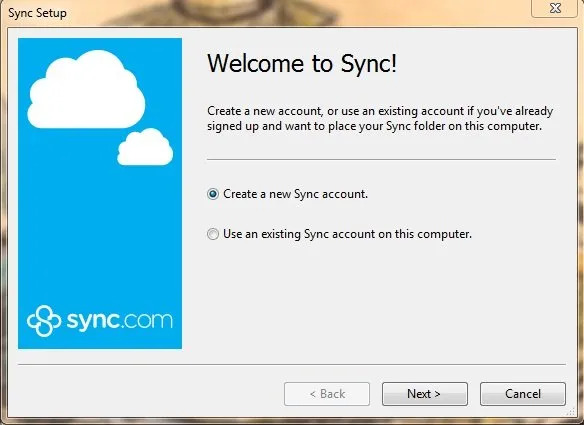 Download the Sync software or create a new sync account directly from sync.com. Insert your email and password accordingly. These are the login credential for you. Pick your desired destination for the Sync folder. This is where you can drag and drop all your files and folder effortlessly. Installation is complete. You can start storing your files on the cloud now. Before I get into the explanation of various features Sync.com offers here. We will visit the vast array of possibilities you can access. As soon as you open their website, you will find a very simple user interface that will be a breeze to navigate. And, by using that interface, you will be able to notice some of their important features. Here are the 8 features from sync.com in brief. 1. You can use their services from any smart device, computer, smartphone, tablet, and many more. Furthermore, they work with all popular platforms. 2. You can have access to your files even without being online. 3. They offer 5GB of storage for free and up to 2TB of storage for paying members. 4. You can share files with your friends even if they don’t have a Sync account. 5. Excellent and quick-reacting recovery and backup fail-safe. 7. 30-day file restore capability for free users, and indefinite file restore for Pro users. There’s 5GB of storage for free. 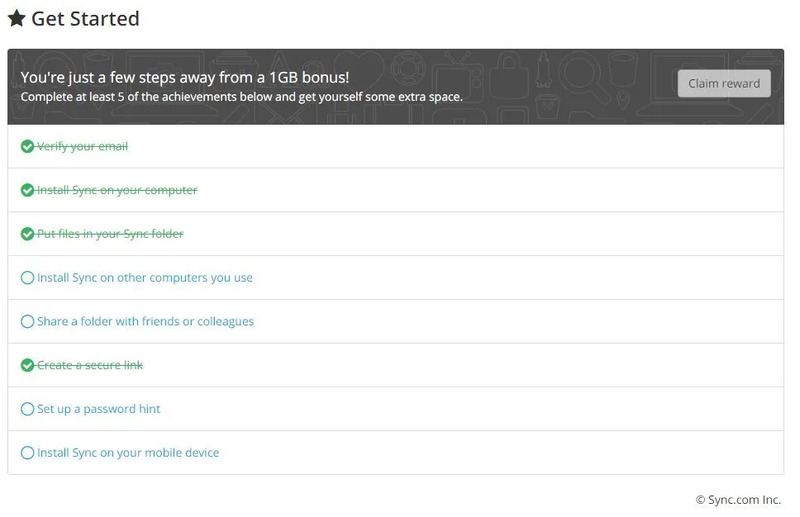 To sweeten up the deal, there’s additional 1GB free bonus for you to claim if you complete the 5 achievements. Which are all very simple by the way. But, if you think 6GB of free cloud storage are simply not enough. You can always opt to pay for one of their Personal Pro plans and gain access for anywhere between 500GB and 2TB of storage. Once you upload your files, you can access them in three primary ways. Which are by using web browser, mobile device, and, of course, their downloadable client software platform. 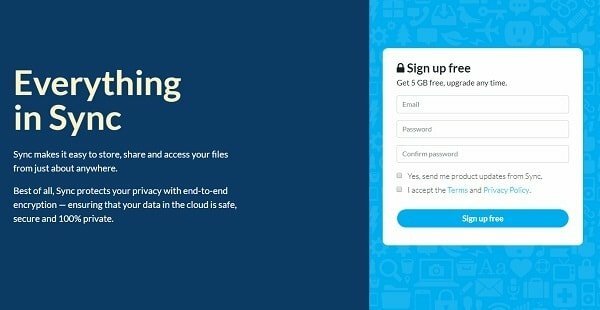 Uploading your files to the cloud will protect them from fatal hard drive crashes or other corruptions. I had “blue screen” before. The next thing I know, all my files are gone! The big benefit of using cloud storage as opposed to using your internal memory is the ease of file sharing. You are not only sharing your files with friends but actually use Sync.com to boost your professional performance. This can achieve by setting up multiple devices with the ability to edit files. The edits are actually shown in real time to anyone who has the file open at the moment. This alone will make it an excellent feature for project coordination. To set this up, you need to click on the “share” button. 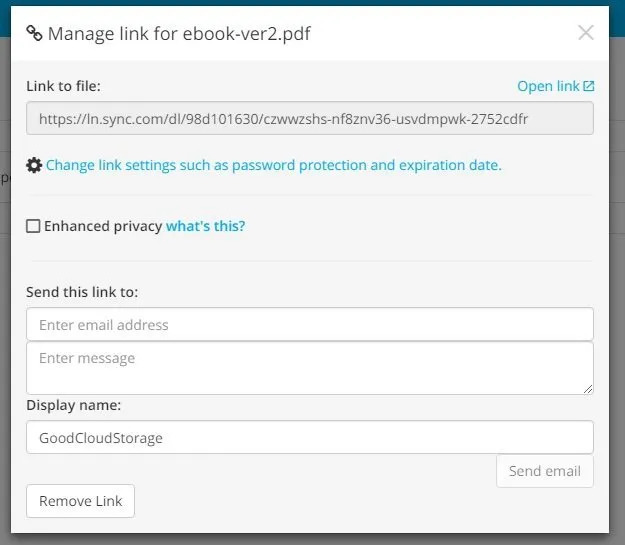 If you are trying to share a file, you will generate a link you can hand out, and anyone with the link will be able to access the file. But, if you are trying to share a folder, you will have the option of inviting specific people to access it. And, the people you are inviting don’t have to be a registered Sync.com users – all they need is to have an email address. You also have the option of sharing upload links. With those links, your friends and colleagues will be able to save files to your storage. And, you will have full access to those files automatically. There are three levels of clearance you can give. You can allow the people who receive the link to edit the files or restrict them to viewing them only. Or you can give them the ability to add other people in and set up the permissions for those people themselves. Unfortunately, giving that power can be considered as a security risk. That is why Sync.com allows you to set up expiry dates for your links. Also, you can protect your files by attaching a password to the links. Sync.com offers incredible capabilities when it comes to versioning. With this platform, you will have the option to roll back any changes that you want. And, that doesn’t only go for accidental file deletions. You can also roll back any changes that were caused by disk errors or computer viruses. Free users will be able to access previous versions of their files for up to 30 days. The best part, Pro users are able to save any and all versions of their files for as long as they want. What’s more, those versions won’t even take up your cloud storage space. Pro users can also use the Sync.com’s “vault” feature. This feature allows the user to create an on-the-cloud file or folder backup. Cloud storage security is one of the most important factors people have to consider when they are choosing cloud storage service. After all, we all know what can happen if the safety isn’t good enough and your private data ends up going public. That is why you should always opt for services with powerful safety features. “Zero-knowledge architecture” is the way to secure your privacy. Put it in a simple phrase, this feature making sure that nobody else can have access to your data. And, when I say ‘nobody,’ I meant no other human-being! If you are looking for a quick check at the secure cloud storage. Check out these 3 most secure cloud storage available now! Not even the customer support or other employees of the cloud storage platform can see it or will be authorized to access them. It is quite possibly the single best way to protect your privacy online, at least when it comes to most non-technical user like me. No additional settings or requirements are needed. There is, of course, a downside to the feature. If you ever forget the password to your account, you will not be able to access it either. As I mentioned earlier, Sync is from Canada. 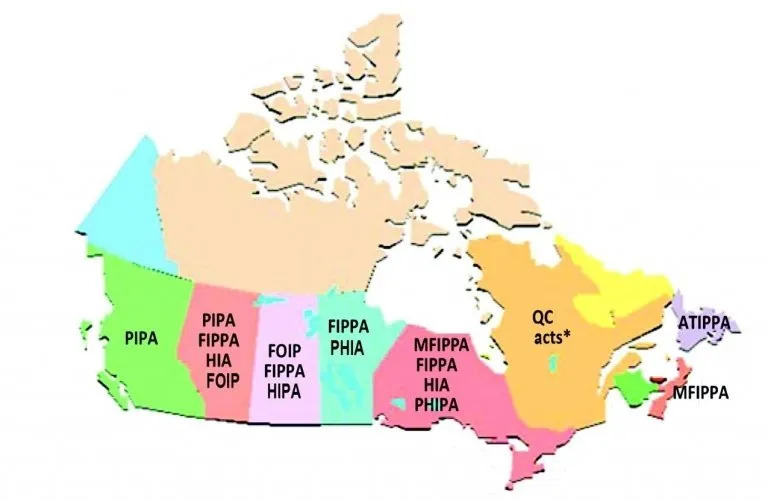 And Canada has incredible privacy laws that can further help you to protect your data. Now I will opt for a bit more specific technical approach, and we will turn away from layman’s terms for a while. Those who know what I am talking about will definitely appreciate the safety features of Sync.com. Sync uses a 256-bit Advanced Encryption Standard (AES). They further secure their transmissions by using Transport Layer Security tunnels (TLS). The TLS are able to prevent potential eavesdroppers from getting a glimpse of the data going through. The protection of encryption keys achieved by using a 2048-bit RSA. Furthermore, their data centers have the SOC-1 certificate. And, if they ever happen to suffer from a server failure, the RAID architecture is there to prevent any possible data loss. Unfortunately, as safe as the zero-knowledge encryption is, and as powerful as their AES encryptions are. There is another potential weakness when it comes to security – the user. That is why it is very important for you to come up with a good password that will prevent the hackers from guessing their way into your account. Avoid any of the famous or “clever” passwords you have seen online. Those passwords are the first ones that your potential hackers would try. And, even if they can’t guess it right, the password is too weak and they could simply brute-force it and open your account. 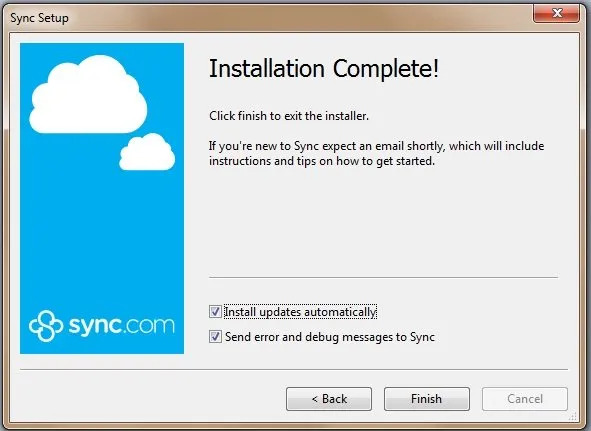 Of course, Sync.com had that in mind when they were designing their platform. That is why they offer a very easy to use two-factor authentication below. That way, you can make sure that nobody can access your account. While, it makes sense though that if no one can access your data (not even the employees of the service itself), you assume your data is safe. But, it still doesn’t hurt to see that Sync.com follows Canada’s privacy laws, which are very strict when it comes to consumer protection. Check out yourselves here how they are protecting you. Now, we know we have been differentiating between free users and “Pro” users. And, for most companies, that represents a pricing system that can really hurt the pockets. But, with Sync.com, this is not the case. Even if you opt to go for their 2TB Business Pro plan, the monthly subscription will only cost you 5 dollars per user. But, bear in mind that you must have at least two users for that plan. This plan comes with 1TB of storage per user, advanced sharing options, and admin controls. In short, it cost you $10 per month to have 2TB of storage where 2 users can have 1TB each of them individually. While this is oppose to pCloud who can have the 2TB all by your own with just $7.99 per month. That’s why pCloud had always been my favorite cloud storage service. If you want to use the Sync platform alone, you can use their Business Solo plan that will only cost you $8 per month. It has the same functionalities as the Pro plan. But it doesn’t come with admin controls, as a single user doesn’t need them anyway. But, if the 2TB of storage you get with these plans still not be enough for your needs. In which I would be scratching my head guessing what the heck are you storing that would consume all the 2TB storage. If that is the case, you can always turn to their Business Advanced plan. This plan costs $15 per month, per user. But, for those that need the extra storage, it is very well worth it. For starters, the plan will let you use up to 10TB per user. Furthermore, it is the only plan that allows you to use live chat support. Good paying customer does deserve more as they said. Of course, for those who are on the fence about using Sync.com, we would recommend using their starter plan (5GB). It is free, it doesn’t expire, and it has every basic feature you would need to use their services. Billing cycle for Sync are all in yearly term. There’s no monthly payment. If you are looking for affordable monthly recurring cloud storage, do check out pCloud review here which I believe provide an incredible deal for normal users like us. The best way to check if a service is good is to check with as many users as you can. So, instead of relying on my own judgment, I reached out to other users to see what they thought of the platform. And, as I expected, the two things that the people can’t stop praising are the free storage and the zero-knowledge architecture. And that goes for literally everyone we spoke to. They love the prices and the abilities of this platform. While my sample size might be small (we manage to gather 8 people), it’s good to know that they all share the same common ground about Sync.com here. Even I am surprise on how easy it is to use Sync.com cloud storage service. I had been using various cloud services ever since they made their debut. Usually by the end of the testing, we find out that most of them are quite similar and not difficult to learn for the first time. But, with Sync.com, it really does seem like nobody (total 9 including me) is running into any difficulties. The files and folders are separated which is good. Unlike Upthere from WD, only allow to upload files and not folder. Sync.com supports drag-and-drop function and it really fast. The only flaw users have noticed is that the security features seem to be slowing the system down. I suspect there are extra layers of encryption, decrypting which takes a bit of time. 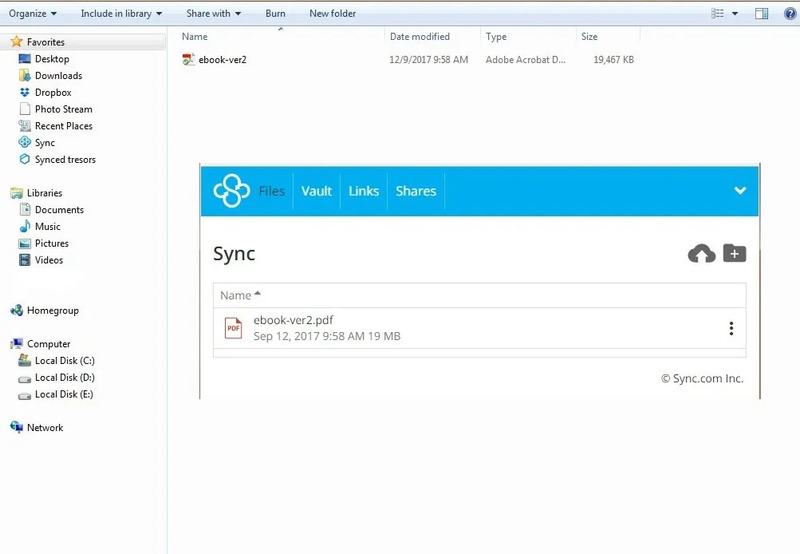 The “vault” feature is an ultra-secure file archive from Sync. The only way to move a file or folder to the vault is by using their web portal interface. This feature provide top-notch security protection for all your files and folders. However, I find the upload and download process very slow. This might be due to the extra encrypting process that are taken in place during the file transferring. Hope this might be something that you want to take note on though! The 2 factor authentication is another layer of security for user. If you enable it, it will further strengthen your web login process. 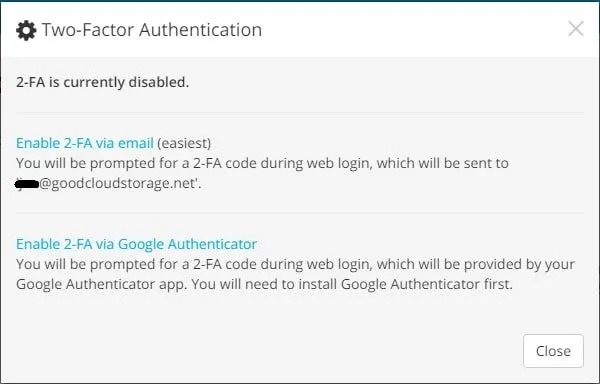 However, this 2-FA require additional Google Authenticator app which you can download them here. Sync has a lot to offer. We had compile an overview of Sync’s full features. Check out all their available features below. Click the + to reveal the details. The Conclusion – Is Sync.com Pride of Canadian Cloud Storage? Overall, Sync.com really does seem to deserve the top rating that it is getting from most users. It is fast, easy to use, and it offers incredible sharing options. But, the highlight for me, and for many other users that prefer Sync.com to any other service, is the fact that their security is unparalleled with no additional cost. So, if you need a secure cloud storage solution, I can recommend Sync.com as one of the best choice for you. As far as my opinions go, this service deserves a five-star rating. Try it to believe it, get 5GB free account from Sync.com now.